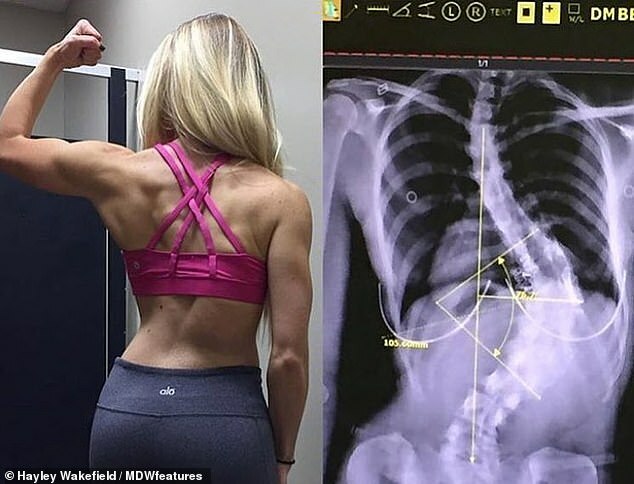 An Instagram star is refusing to have surgery to correct the 80-degree curve in her spine - despite doctors warning it could kill her. 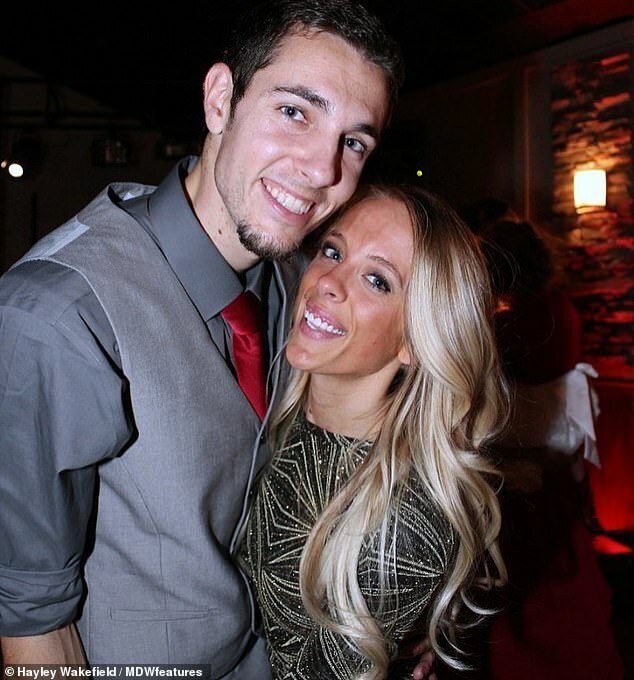 Hayley Wakefield, 25, from Scottsdale, Arizona, was diagnosed with scoliosis at just nine, when her parents noticed her hips were uneven. Doctors warned the Instagram star's parents that without surgery her spine would curve into her heart and potentially kill her. But after doing their own research, her parents discovered no-one has actually ever died from the condition. Miss Wakefield, who has more than 80,000 followers on Instagram, therefore shunned the operation in favour of chiropractic care, stretches and exercises that strengthen the muscles that support her spine. Slowly, the curve of Miss Wakefield's spine has reduced from 92 degrees to between 75 and 80. Miss Wakefield said: 'When I was diagnosed with scoliosis we had medical doctors tell my family and I that if I did not get the surgery my spine could curve into my heart and that I could die. 'We soon later discovered that no one had ever died from scoliosis. 'Sadly, in the traditional medical field they are not taught other methods of treatment and many believe that surgery is the only route. 'If you opt for the surgery they place metal rods all up and down your back. The more severe your scoliosis the less likely this surgery is to actually help. After reading about how other scoliosis sufferers have had poor experiences with surgery, Miss Wakefield decided to instead focus on staying active and strengthening her back. 'I still stand behind the decision to practice alternative methods and to this day I live with very little pain,' she said. 'It is an extremely slow process, but I have been able to decrease my curve by implementing certain exercises and stretching techniques that were designed for me and my curve by one of my chiropractors. 'Everyone's case is totally different though and although I help people decrease pain and stiffness, I never guarantee I can help people decrease their curve. She added: 'I was blessed enough to have my parents and grandparents who instilled in me that I was not disabled and I could do anything that anyone else could do. Scoliosis is the abnormal curvature of the spine in an S-shape. Signs include a visible curve in the spine, one shoulder or hip being more prominent than the other, clothes not hanging properly and back pain. Pain usually only affects adults with the condition. In most cases, the cause of the scoliosis is not known but it can be caused by cerebral palsy and muscular dystrophy. In the UK, scoliosis affects three to four children could of every 1,000. It is also thought that as many as 70 per cent of over 65s have some degree of scoliosis. It is more common in women than in men. Most children with the condition do not require treatment as it is mild and corrects itself as the child grows. However, in severe cases the child may need to wear a back brace until they stop growing. Occasionally, a child needs surgery to straighten their spine. In adults, it is usually too late to treat the condition with a back brace or surgery so treatment revolves around reducing pain. Miss Wakefield does not feel her condition affects her day-to-day but admits she does somehow get down about her appearance. However, with time, she has come to see it as part of who she is. 'I preach to my online followers the importance of confidence and owning whatever flaws we have, but of course being human I have days of insecurities as well,' she said. Overall, Miss Wakefield strives to live as normal a life as possible and preaches acceptance among her followers. 'Don't be defined by the cards you've been dealt. A problem is only as big as you make it,' she said. 'I took my situation and used it for good and hope to inspire and help as many people as possible. Miss Wakefield has even released an eBook with tips for other scoliosis sufferers. 'I take so much pride in my eBook and know that if people implement the tools inside they can greatly benefit their life. My goal is to get my eBook in as many people's hands as possible,' she said.